Have you ever been strawberry picking and you come back with more berries than you know what to do with? Well that is exactly what happened to us two weekends ago – we picked about 10 pounds of strawberries. No, that’s not a typo. Seven pounds are now in our freezer. 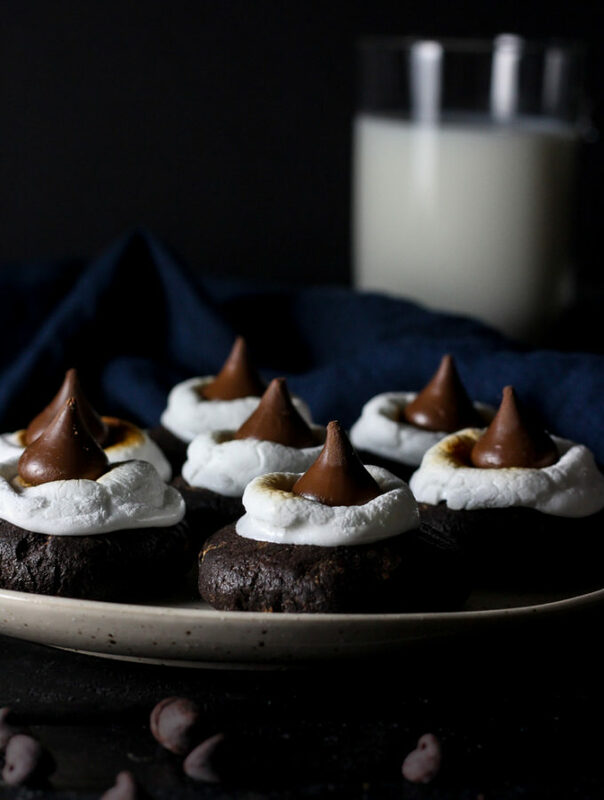 After we consumed about a pound of them, I decided the most fitting way to attain more space in my fridge would be to bake and bake and bake some more. 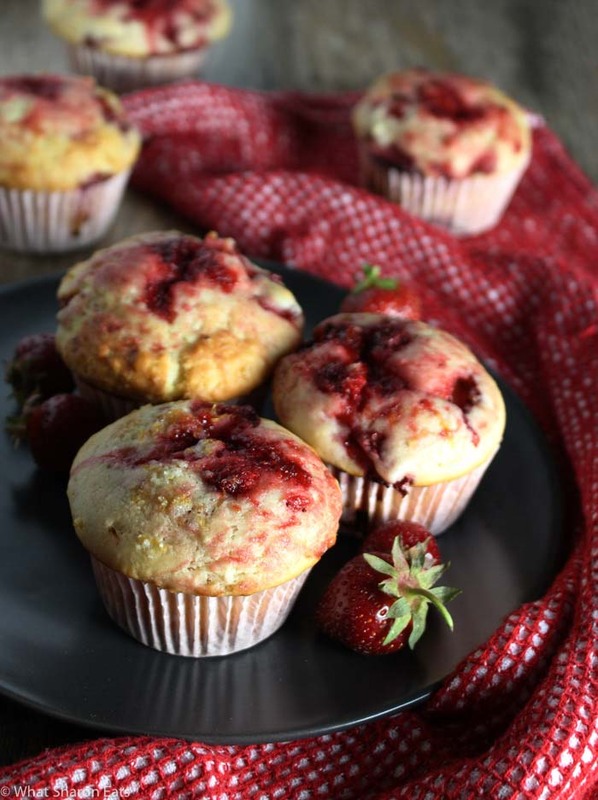 And that’s how we wound up with these delicious strawberry muffins. 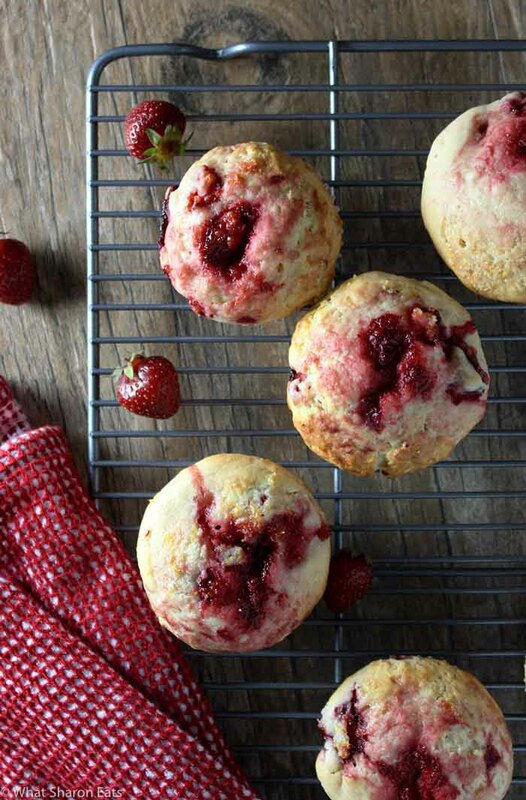 These muffins are filled with homemade jam and are made extra moist through the use of buttermilk. 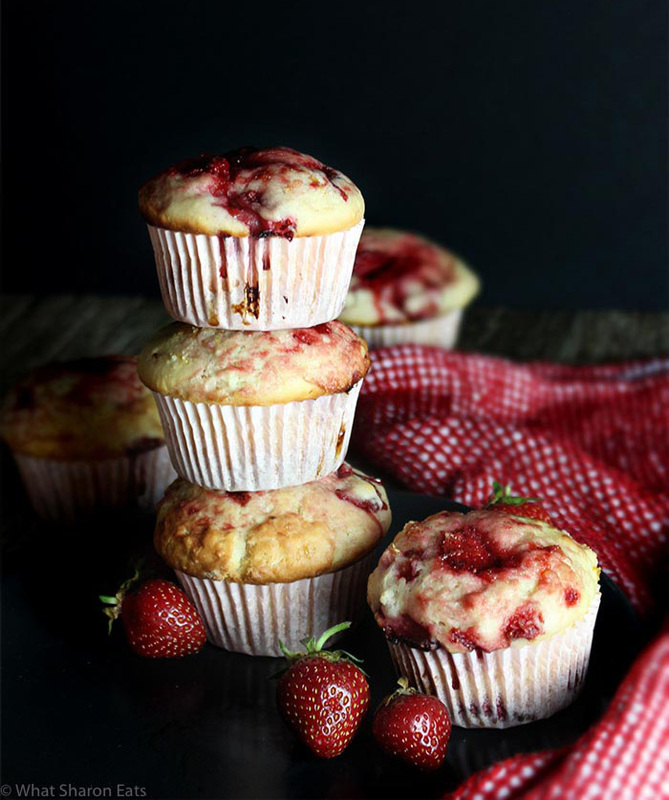 A few tips: if you don’t like having chunks of fruit in your muffins, feel free to slice the strawberries smaller. Also, make the jam first as that will need to cool before you add it to the batter. Just heat up half a cup of strawberries and 1 tsp. of sugar in a saucepan, mashing the berries into a thick sauce. The usual baking rules apply here. 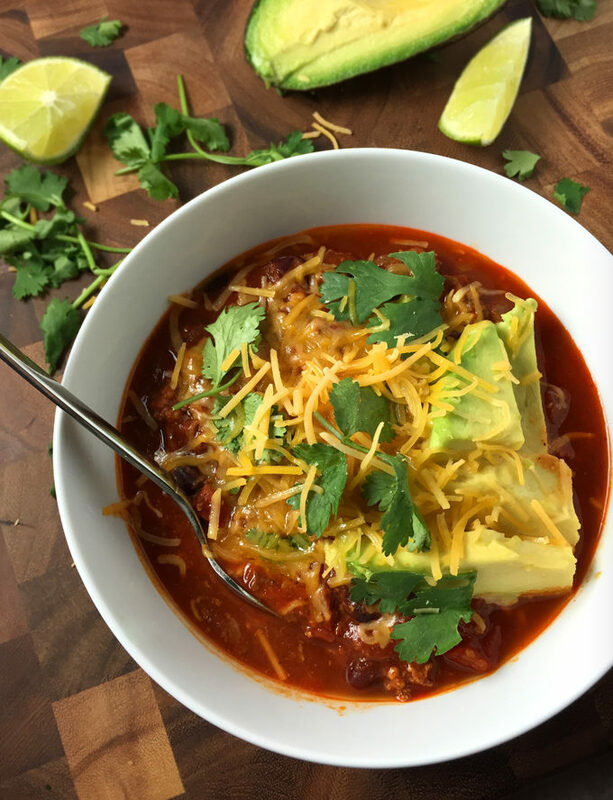 You’ll want to whisk together all the dry ingredients first and then the wet ingredients in another bowl. Combine the wet ingredients with the dry ingredients. 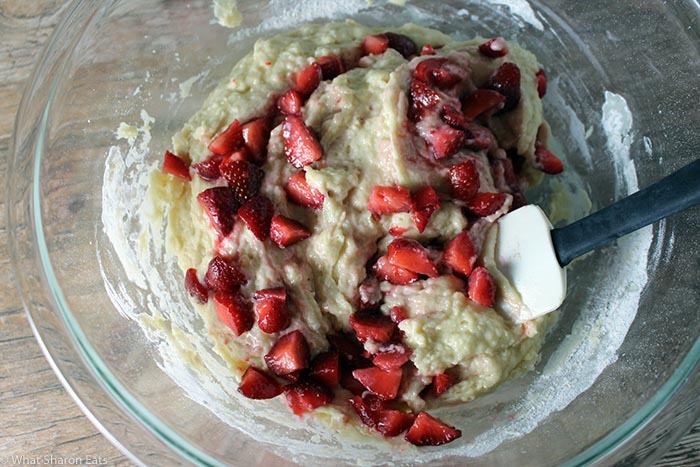 Fold in the strawberries until just incorporated. With muffin recipes, it’s important not to overmix. Otherwise the muffins will become tough. It is fine if the batter appears lumpy. Though optional, I highly suggest you don’t skip the lemon sugar topping. 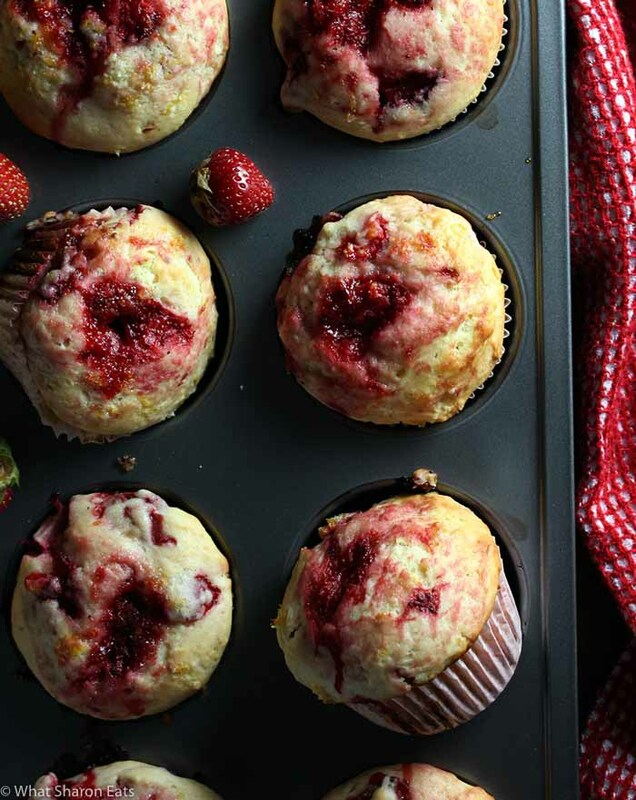 It browns the muffin tops and turns any strawberries on top into jam. Because we were having these muffins for breakfast, I reduced the sugar amount. If you like muffins on the sweeter side, add 1/4 cup more and add some frosting on top. 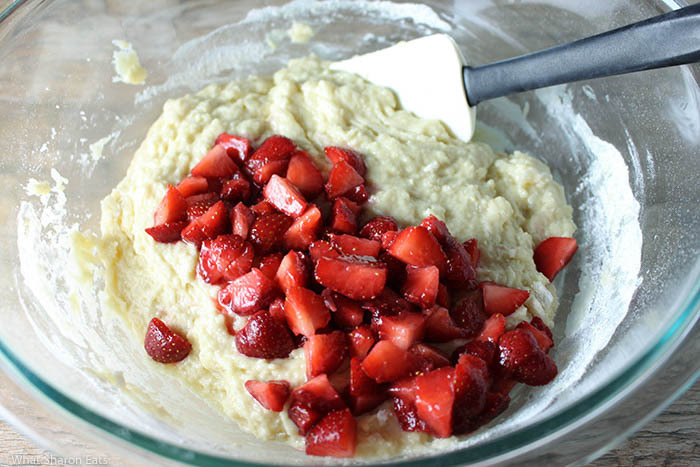 What other strawberry recipes have you made? 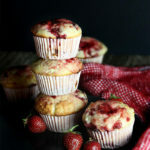 These moist strawberry muffins are filled with homemade jam and finished off with a lemon-sugar topping. 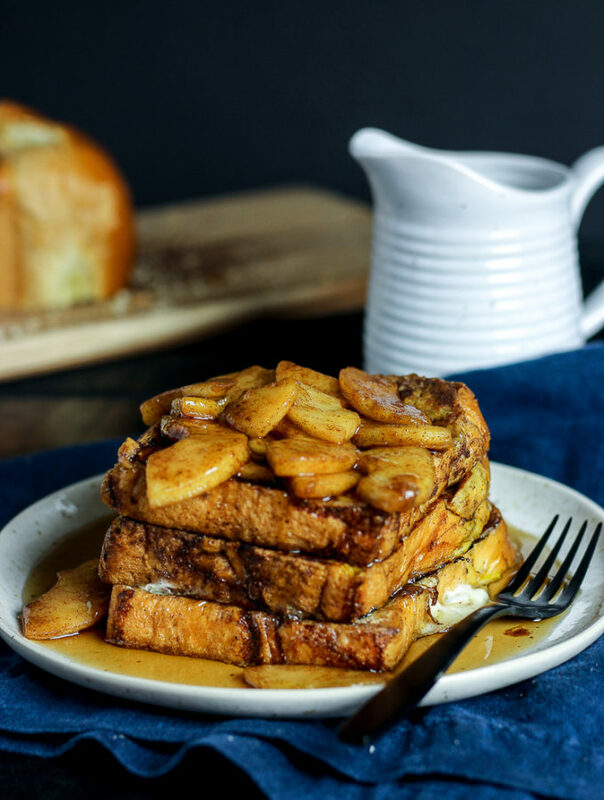 They are perfect for breakfast or dessert. Preheat oven to 425 degrees Fahrenheit. Adjust baking rack to the middle position and grease or line a muffin pan. Set aside. Bring 1/2 cup of strawberries and 1 tsp. sugar to a simmer in a small saucepan. On medium heat, cook and mash the berries with a spoon until the mixture is reduced down to a thick sauce. Set aside to cool. While the sauce cools, in a large bowl, whisk the flour, baking powder and salt together. In a medium bowl, whisk 1 cup sugar and eggs together. Add 1/4 cup more sugar if you prefer sweeter muffins. Whisk in butter, oil, buttermilk, vanilla until just combined. Pour the wet ingredients over the flour mixture and then mix together. Do not overmix. It is fine if the batter is lumpy. 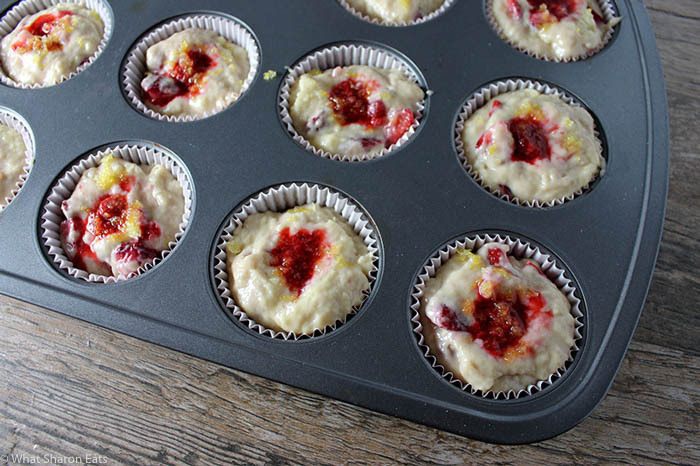 Divide the batter equally among the muffin cups. Spoon about 1 teaspoon of the berry mixture into the center of each. 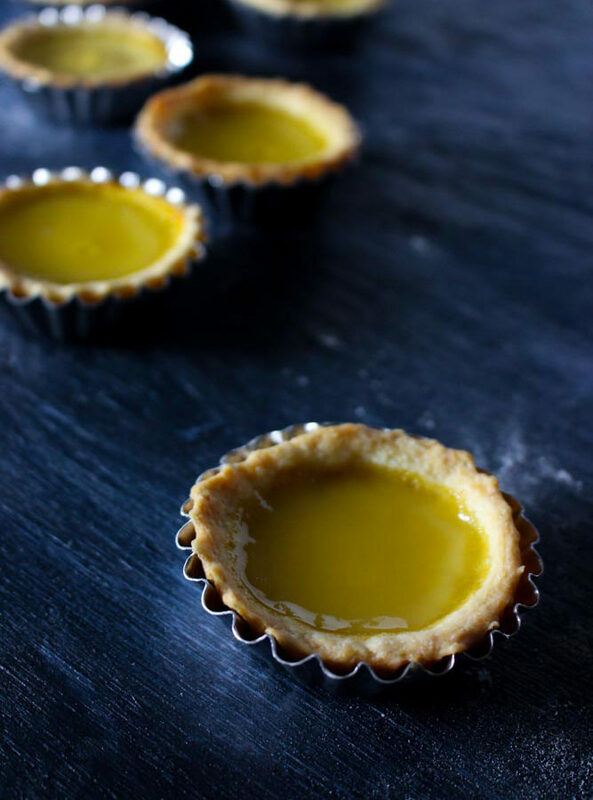 Sprinkle some of the lemon-sugar topping onto each muffin cup if desired. Bake for 17-19 minutes, rotating the pan halfway. Cool for at least ten minutes before serving. Adapted from the America's Test Kitchen TV Show Cookbook. Yummy yummy in my tummy! Remember when you made these and brought them to work… you left them at your desk and I accidentally ate all of them?! These are my favorite. Haha As a matter of fact, I do! Glad you enjoyed them!